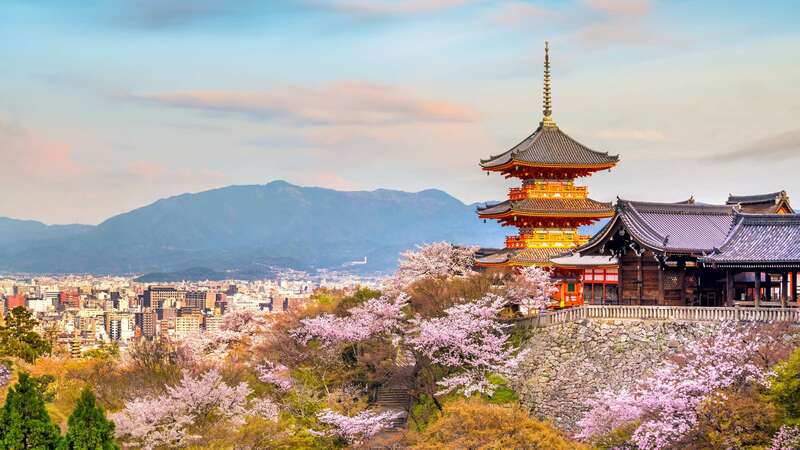 Kyoto was the capital of Japan for over a millennium, and is still considered one of the most beautiful cities in the country with temples, shrines and ancient buildings. Where else can you unwind with the mindfulness of Zen meditation while being surrounded by mountains and tranquil forests, before heading back to a cutting-edge hotel decked out with innovative gadgets? Spring is a wonderful time to visit, when the whole country celebrates the arrival of the famous pastel-pink cherry blossom. 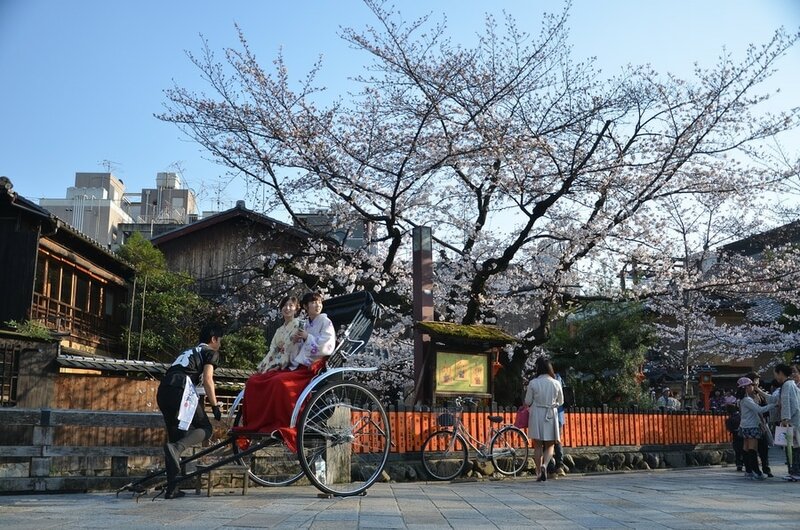 From late March until May you can experience the age-old festival of Hanami, and enjoy the picnics, parades, and concerts held in honour of the new season. 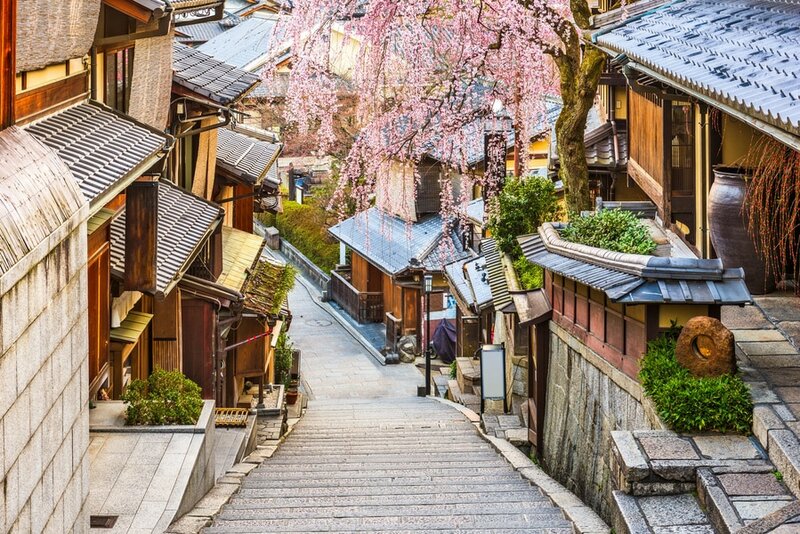 The Arashiyama district in the western outskirts of Kyoto is a popular destination for those wishing to see the blossom, which is best seen from the scenic Sagano Romantic Train. 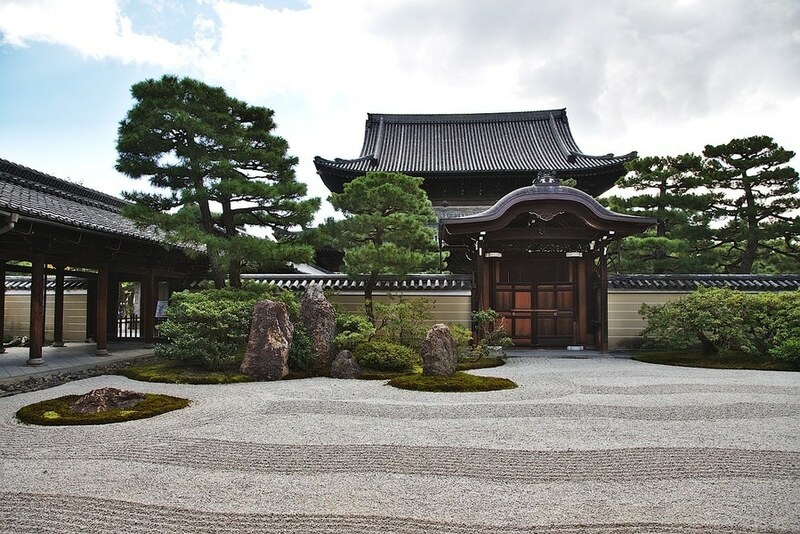 Ryoanji Temple is home to a renowned Japanese garden which is considered one of the best examples of traditional Karesansui (Japanese rock gardens). The garden has 15 stones, but the layout cleverly plays with perspective so that you can only ever see 14 stones from any one angle. It’s believed that in order to see all of the stones from the same viewpoint, the viewer must obtain spiritual enlightenment. Visit the tofu restaurant for exquisite Buddhist dishes, which you can eat while looking out over the beautiful gardens. 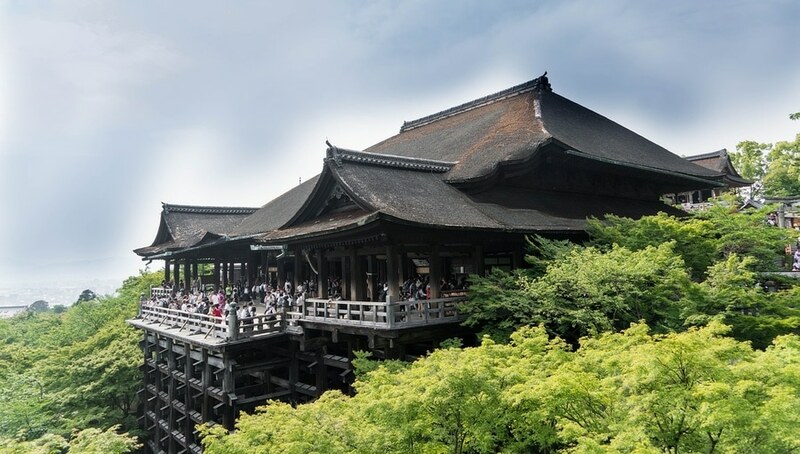 Kiyomizudera Temple is one of the most popular sightseeing spots in Kyoto. On the way to the temple, explore the streets filled with restaurants and shops but be prepared to walk up a few steps. The views of the city and mountains beyond are worth the climb when you get to the top and look out from the magnificent wooden balcony. Here you can also visit the Jishu shrine, dedicated to the god of matchmaking, and the Otowa waterfall believed to grant wishes to those who drink the water. Kinkakuji Temple was built in 1397 and is a prominent symbol of the opulent Kitayama culture, which dominated the late 14th to early 15th century. 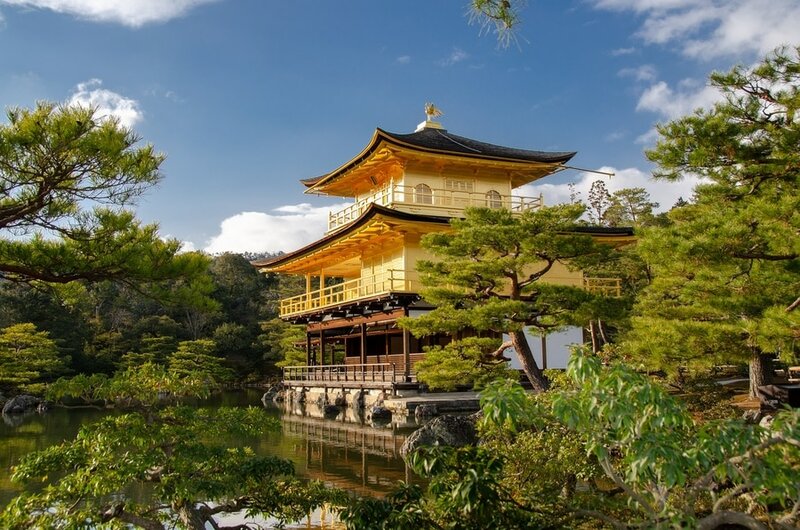 The golden pavilion is called Kinkaku and has three floors, each with its own style. Visit this temple at sunset for a stunning view of the orange light reflecting off its walls, making it look like it’s on fire against the silhouette of the rolling hills behind it. 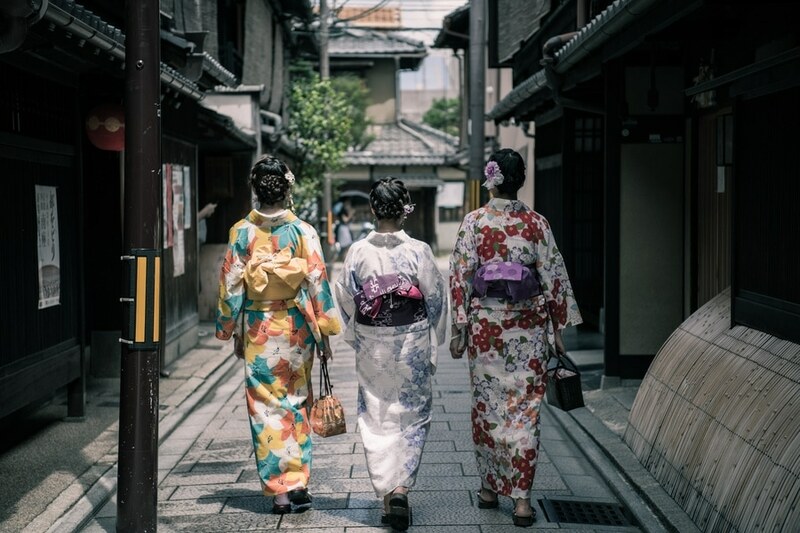 If you have your heart set on seeing the elegant and poised Geisha for yourself, then set aside some time to explore the Gion district, which is a 15-minute walk from Kyoto station. Here, you can often catch glimpses of beautiful Geisha walking along the stone paved streets on their way to a tea house. This is a lively part of the city, reminiscent of the old Kyoto city with plenty of exciting places to see as you wander about. Here you can visit the oldest Zen temple in Japan, Kenninji, which has striking paintings of silver dragons on the ceilings. When lunch beckons, take a walk down Hanami-koji Street which runs from North to South Gion, where you will find tea houses and traditional Japanese restaurants. 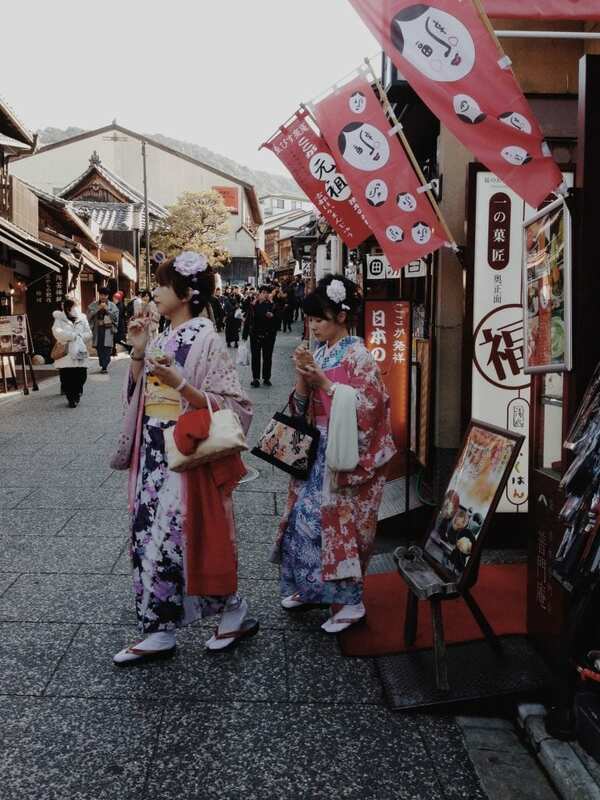 The different areas of Gion have their own characteristics, with ancient buildings renovated into luxury restaurants, bars, and high-end brand shops. 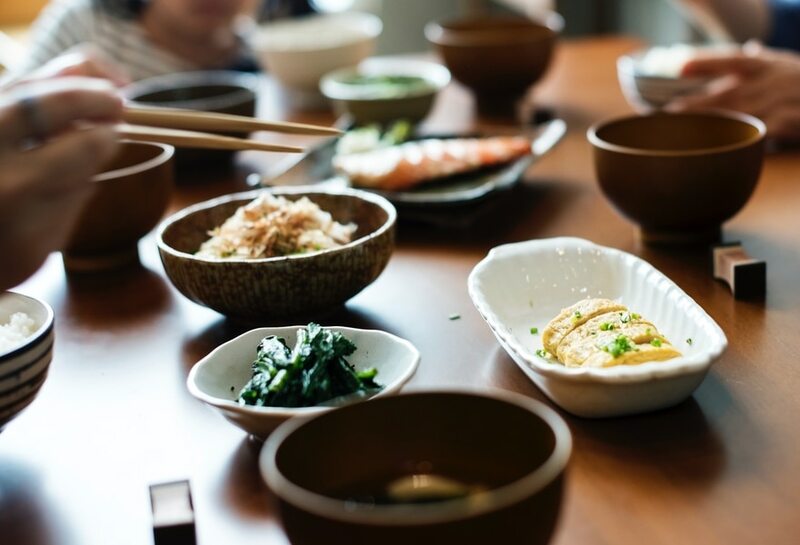 Because of its pure water, Kyoto is known for producing the best tofu, sake, and soba noodles, but you can enjoy other traditional dishes such as unagi, tempura, and saba sushi. For a special evening, book a table at Hyotei, a beautifully decorated Michelin three-star restaurant where you can dine on the best kaiseki (Japanese haute cuisine). If you are keen to have your Ramen fix, then head to Wajo Ryomen Sugari in downtown Kyoto, a popular restaurant that usually has queues of people waiting to enjoy a steaming bowl of noodles. 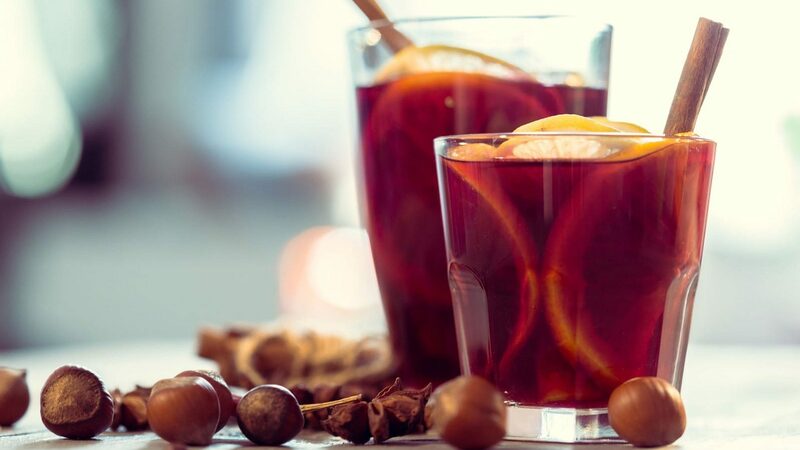 The chefs pay close attention to every element of their dish, from the quality of the stock to the freshness of ingredients, resulting in a truly delicious and authentic meal. Just outside the Gion district, you will find the Machiya Starbucks. 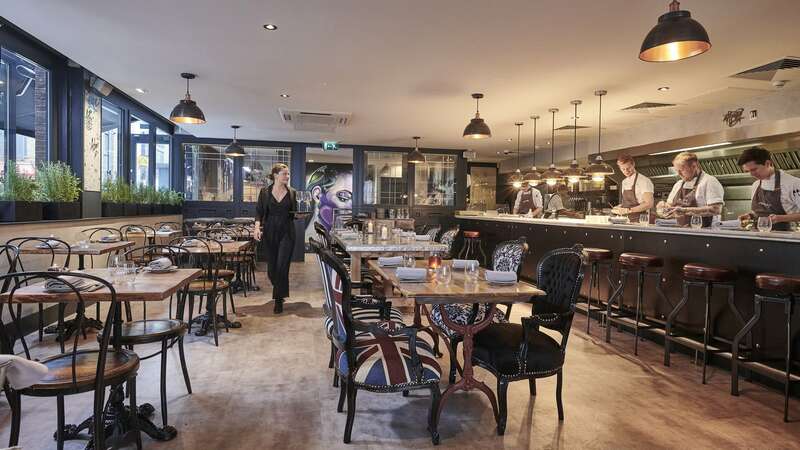 On first seeing the traditional, unassuming 200-year-old building, you would never think that this was a Starbucks – but it serves all the well-known drinks like frappuccinos and iced lattes. Take your order upstairs, where the interiors are styled as a classic Japanese home with floor cushions and minimal lines. Take a relaxing stroll down the Philosopher’s Path, a pleasant narrow walkway found on the eastern side of the city that runs along a canal. A Japanese philosopher named Nishida Kitaro would walk here when he needed time to think about his work, experiencing the beautiful surrounding nature while mulling over his ideas. Nijo castle is in the centre of the city, where you can find a beautiful Japanese garden and Ninomaru Palace. The palace was originally used as an office and living quarters by the founder, Tokugawa Ieyasu, and is filled with over 3000 paintings by prominent artists from the Kano school. 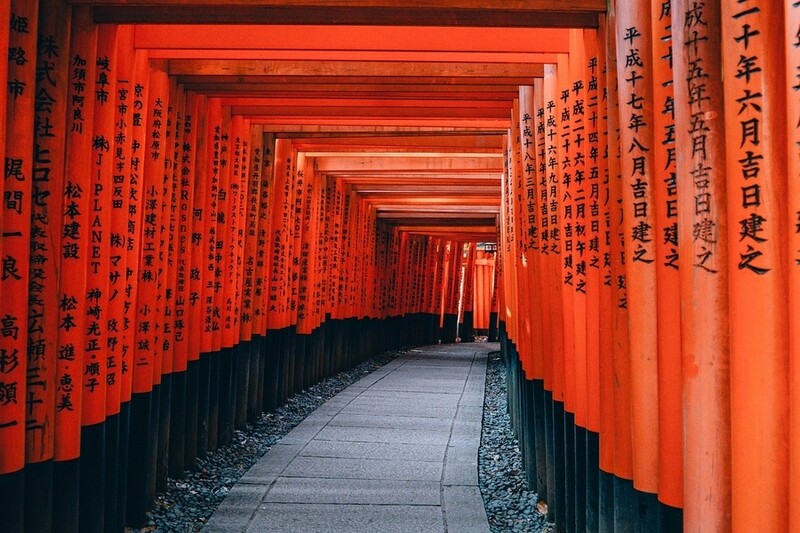 Fushimi Inari Shrine pays homage to Inari, the Shinto god of rice, agriculture, and business. There are many Inari shrines across the city, recognisable by a statue of a fox, but this is the leading one to visit at the top of Mount Inari. It’s a long journey once you walk through the first entrance, with market food stalls and resting places along the way. The distinctive red Torii gates line the route, 10,000 of them to be exact. You’ll find the most picturesque area is the Senbon-Torii part of the shrine, where the gates are positioned close together to create an unusual walkway. Yotsu-Tsuji is a rest area on the side of the mountain above the shrine and offers a spectacular view of Kyoto. At night, the paths and Torii gates are lit up, creating a magical feel. 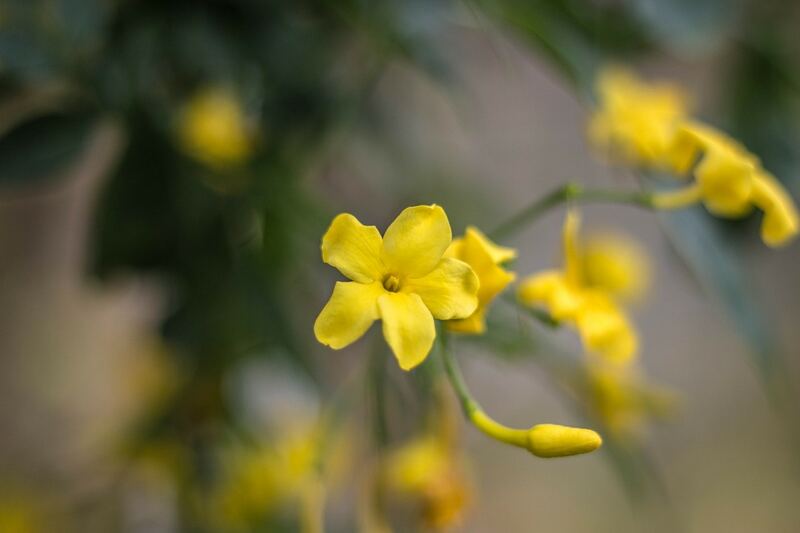 It’s flowering season for the winter jasmine, so you have a perfect excuse to don the gardening gloves and welcome some drops of colour into your winter gardens.